During my lunch break from TEDxPhilly (which was all kinds of awesome, by the way), I decided to take a nice walk and check out the new Philadelphia Chutney Company. They pretty much serve dosa. 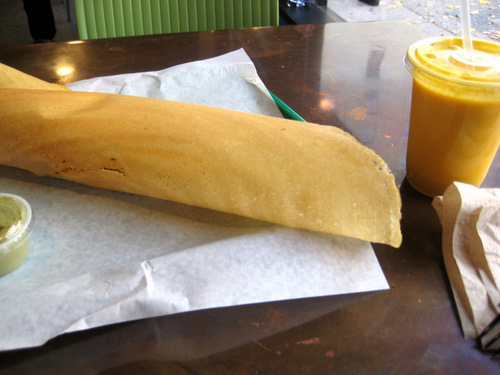 Until my trip to Colorado, I’d never had dosa before. And now there’s a restaurant that only sells it. Man, there’s so much I don’t know about food. It’s on Sansom, so unless you know it’s there, you might not see it, which is unfortunate. The inside is colorful and clean. 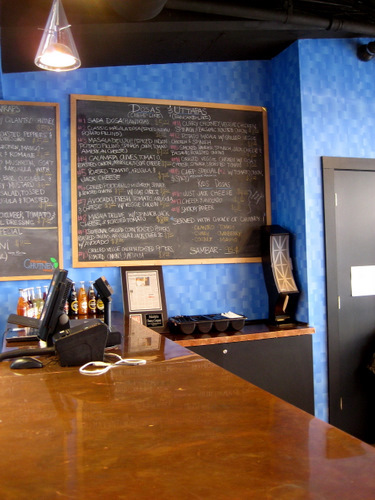 You order at the counter and wait for your food. It’s easy. P had told me that she liked this place, but that I should try to stick with more of the traditional dosas and not go all fancy. So I followed her advice and just got the old school masala dosa, which was just potatoes on the inside. But not plain potatoes, hot and firey potatoes. So the outside is a thin crispity crepe type thing, and they roll it up after filling with innards. In my case, those hot and firey potatoes. I asked the girl behind the counter how the heck do I eat this thing, and she suggested ripping some of the crepe off and then scooping the innards with it. So that’s just what I did. And you get to pick a chutney too. This was hearty and filling, but surprisingly spicy to me. Luckily I picked up a cool mango lassi to tone it down a bit.